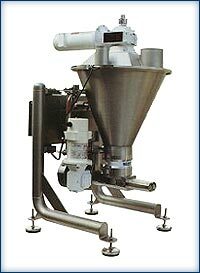 Neptune Nimble Skids are complete metering systems ready to use with any bulk or intermediate bulk chemical container. Standardized design allows the user to customize by selecting the most popular options. Working within this framework allows shipment of most units within 5 to 10 days. Controls may also be added. 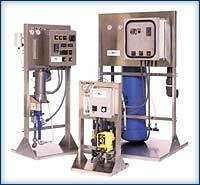 One and two pump systems fit within an 18″ x 30″ footprint. each pump suction. Discharge manifold includes a valve at each pump discharge. Three and four pump Nimble Skid systems are also available with a maximum footprint of 24″ x 46″. Containment is available for all systems. Electronic Diaphragm Pumps with Manual or Automatic Speed Control. discharge manifold and appropriately sized calibration column. 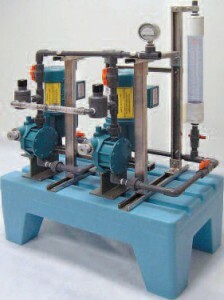 System with PVC piping, as above with one pump. Select and price pumps separately. System with SS piping, as above with one pump. Motor Driven Diaphragm Pumps with Manual or Automatic Stroke Control. with PVC suction and discharge manifold and appropriately sized calibration column. with stainless steel suction and discharge manifold and appropriately sized calibration column.